This section provides a quick introduction of frame of reference, which is a given object or objects we use as a reference to describe locations of other objects in the space. What Is Frame of Reference? A frame of reference is a given object or objects we use as a reference to describe locations of other objects in the space. The location of object in the space can only be described a relation to a frame of reference. Without a frame of reference, we cannot describe the location of any object in the space. 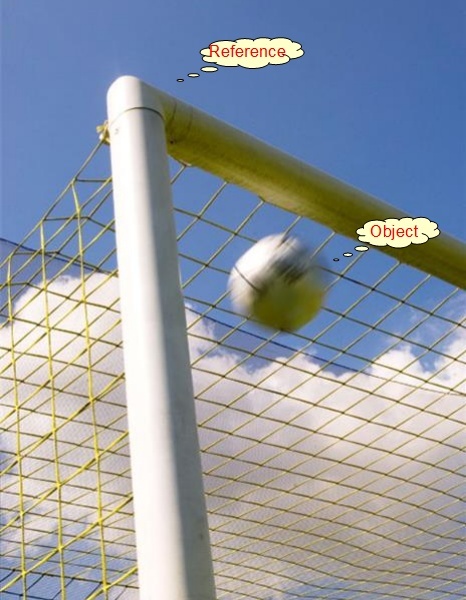 For example, when a soccer ball flying into the gate as shown in the picture below, we can make a statement like: "the ball enters the gate at the top left corner". In the above statement, we are using the gate as the frame of reference. And the location where the ball enters the gate is described as the "top left corner" relative to the frame of reference.